Air- Flow : 1.63 ~ 164 m3/hr. 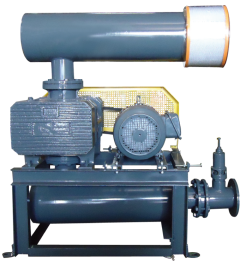 Features: Developed from GRB series provided high rotation speed (up to Max. 4000 rpm) with high efficiency and high output pressure. Application: Water treatment, brewery and beverage industry, fishery, incinerator. Fermenting plant, car washing, sauna, conveying.Teflon coating lobes and equipped mechanical seal type should be used for bio-mass gas transfer applications.